Rare movie posters are going up for sale later this month in a Sotheby’s auction that includes a very special find: the world’s first movie poster, according to the Guardian, created in 1895. The poster, designed by French artist Henri Brispot, was made in France in 1895 to advertise a showing of short films by the Lumière brothers. But unlike modern movie posters, it didn’t depict the subject of the movies. Instead, it showed an illustration of people lining up to see the first-ever screening of a movie on December 28, 1895. The screening included a selection of the Lumière’s short films, each film lasting no more than a minute. Some greeted the screening with suspicion, whereas others seemed utterly shocked by the experience. When the lights went down, Perrot relates that one lady uttered a shriek of terror. Later on, there was wide spread talk of magic and trickery, as though the moving images were the ruse of a clever conjurer. One man complained that it was unfair to make a mockery of the public in such a way. Members of the press who had been invited to the screening did not show up, although surprisingly, within two days of December 28th, it was featured in most newspapers. Now a piece of that history can be yours, provided you have at least £40,000 lying around. The poster is expected to get at least that much when bidding starts on August 28. Dozens of posters are for sale, and there’s a little bit of nearly every genre, from rare posters of sci-fi movies like 2001: A Space Odyssey (1968), The Man Who Fell to Earth (1976) and Alphaville (1965) to musicals like My Fair Lady (1964) and Singin’ in the Rain (1952). The auction also has posters for noir films like Double Indemnity (1944) and Touch of Evil (1958), and spy movies like Thunderball (1965) and The Ipcress File (1965). Posters for classic Hollywood movies like Sunset Boulevard (1950) and even a special lobby card for It’s a Wonderful Life (1946) that was signed by Jimmy Stewart are up for sale as well. There’s also plenty to make Disney nerds happy, including rare original posters for Peter Pan (1953), Lady and the Tramp (1955), 101 Dalmatians (1961), and the Donald Duck short film Donald’s Golf Game (1938). The auction has a very rare Revenge of the Jedi poster, the original name for Return of the Jedi before George Lucas decided that Jedis wouldn’t take revenge. Posters were even made up using the “revenge” title, but were withdrawn, making the original posters quite valuable. The Revenge of the Jedi poster is expected to fetch anywhere from £1,400 to £2,600. The auction includes a fair number of Alfred Hitchock classics, including North by Northwest (1959), Strangers on a Train (1951), Psycho (1960), The Birds (1963) and Rear Window (1954). 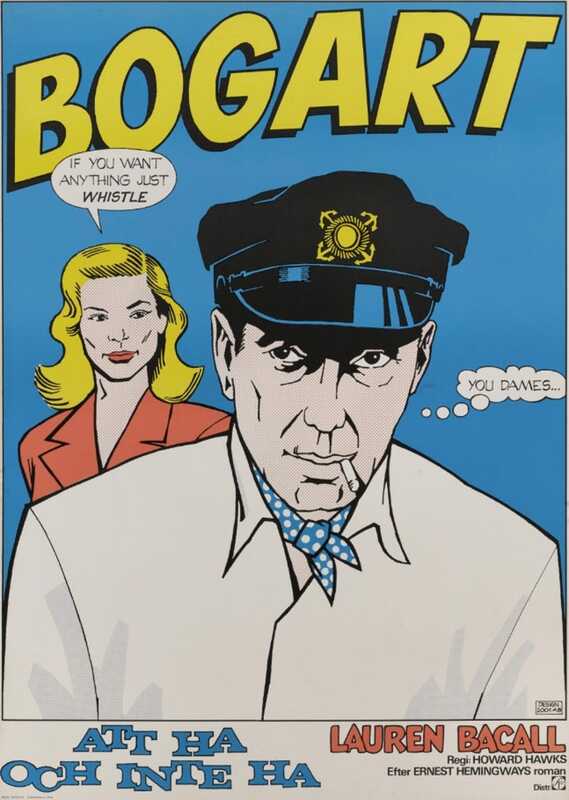 There are also some very cool international posters that American poster enthusiasts might not be familiar with, including a very unique Swedish poster for the 1944 classic To Have and Have Not with Humphrey Bogart and Lauren Bacall. A Japanese poster for the Vietnam War epic Apocalypse Now (1979) is also unlike most of the American marketing that took place for the film. But it’s not just posters. All manner of advertising material for pop culture is being auctioned off, including a standee for a record-book combo that was tied to Disney’s Fun and Fancy Free movie, released in 1947. The auction even has some “preliminary artwork” for some films, including a stunning painting for Gone With the Wind (1939).